I'm back. I apologize yet again for my ridiculously long absense. 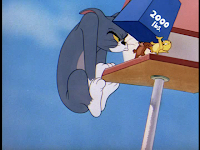 If I keep this up, this Tom and Jerry tribute will never be completed. Now that I have had a relaxing vacation, I hope to go full steam ahead here at the Factory. 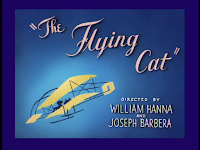 In "The Flying Cat", Jerry once more teams up with the canary from "Kitty Foiled". (at least that is what the bird looks like to me. Anyway, I digress). 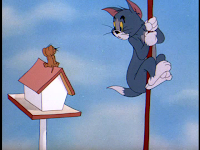 After Jerry rescues the canary from Tom, the two friends hide out in a birdhouse atop a pole. 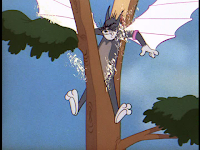 The first half of the cartoon deals with Tom's attempts to scale the pole to reach his prey. 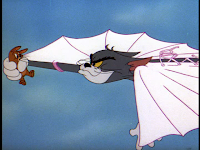 After his ladder is torched and his vaulting pole runs afoul of a conveniently placed roller skate, Tom resorts to making a pair of wings out of a pink girdle. (try not to think about it too much). Tom's new aerial abilities prove to be no contest for the mouse and bird, who invert the birdhouse's roof to deliver multiple nails into Tom's rear (making him a living watering can). In one of the most painful scenes ever (in my opinion), Tom severs a tree lengthwise with his crotch. I cringe every time I see this. Tom is finally lured into a train tunnel where he is crushed into the shape of a train signal hanging from above the tracks while Jerry and friend ride off into the iris out.